Chris Smalling has had his say on facing Barcelona on Wednesday night. Alongside Victor Lindelof, Smalling has established himself as the first-choice central defender under new manager Ole Gunnar Solskjaer. The Englishman is also expected to start in the upcoming midweek Champions League encounter, as Manchester United prepare to host the mighty Barcelona in an exciting European night at Old Trafford. While a gigantic task, Smalling is eager to face Lionel Messi and co., and the 29-year-old has now had his say on the prospect of going head-to-head against arguably the best team in the world. Speaking to the club’s official website, Smalling stated: “I’ve not played against him competitively, personally, but in friendlies and pre-season we have. “That’s someone else who I’m looking forward to playing against and hopefully minimising as many chances as possible, because we know what a world-class player he is. But it’s not just him; I think they’re a world-class team. 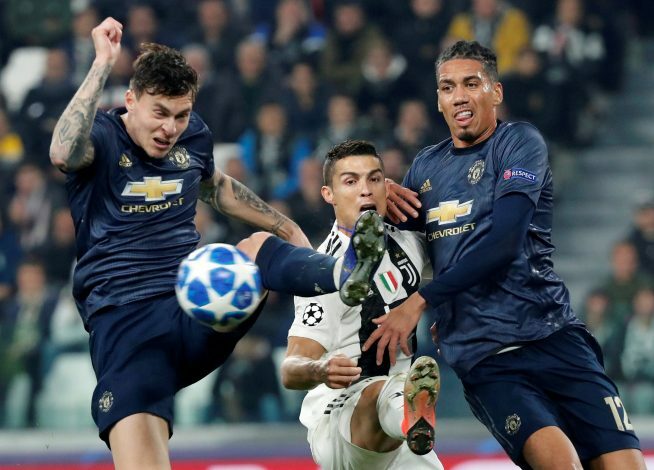 Smalling also shed light on how the team reacted upon finding out that they would be facing Barcelona in the quarterfinals, as he revealed: “We were warming up on the bikes in the gym [when the draw was made]. “Normally we do 10 minutes on the bike and then we do some gym activation, but I think we stayed on the bikes for maybe 20 minutes just because we saw the draw was on the TV. We were all excited. As soon as it came out, we were all happy. We cheered and then we got on with training. But at least we knew who was in front of us.